You don't want to look down and see your stomach getting bigger, but sometimes, it happens. As life gets hectic, a healthy diet and lifestyle start to take a back seat, and the number on the scale creeps up. There are many reasons for weight gain – poor diet, increased stress levels, getting older, a lack of exercise or sleep -- or a combination of issues. The good news is that most of these factors are within your control, and you can lose stomach fat with some lifestyle changes. If you've been subsisting on processed foods, sugar and carbohydrates, your stomach may be getting bigger because of blood sugar imbalances. Sugar and refined carbohydrates cause rapid spikes – and then dramatic drops – in your blood sugar levels. As your blood sugar increases, so does your insulin, the hormone that converts excess blood sugar into fat. High insulin levels signal your body to store fat, especially around the midsection. You can keep your insulin and blood sugar levels steady by eating fruits, vegetables, lean proteins and healthy fats. It's also important to eat balanced meals regularly throughout the day. Replace sugary drinks like soda and fruit juice with water. You can make water more interesting by infusing it with fresh fruit, cucumber or mint leaves. Snack on cut-up veggies or unsalted nuts, instead of energy bars, chips or crackers. Eat protein at every meal. Try eggs for breakfast, turkey slices or tuna for lunch, and chicken or salmon for dinner. As you become more connected through technology, the amount of time you spend moving significantly diminishes. If you're living a sedentary lifestyle, you may notice that your stomach is starting to get bigger. Blocking out a specific time to exercise 30 to 60 minutes every day is a good start, but you should also aim to get more active in general. Engage in an active hobby, such as a sport, swimming or hiking, instead of spending all of your leisure time watching television or sitting down. Just 30 minutes of hiking or swimming can burn 180 to 266 calories, depending on your weight. Play soccer for 30 minutes, and you're likely to burn 210 to 311 calories. Engaging in an activity like this every day can burn enough calories to help you drop a half-pound per week. 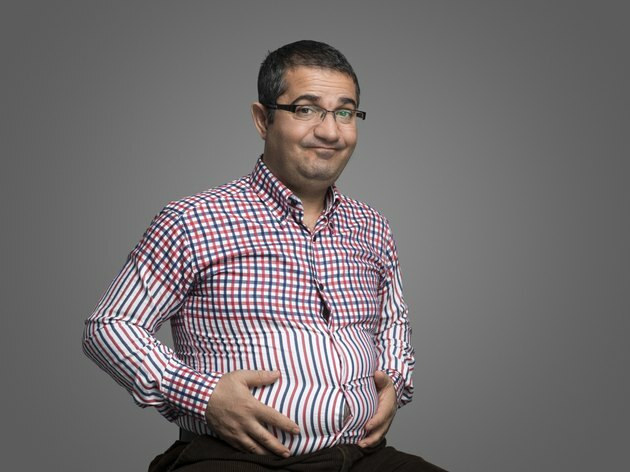 If you've been following a healthy diet and exercising regularly, but you still notice your stomach getting bigger, or you're having trouble losing that last 5 to 10 pounds, stress may be to blame. When you're stressed – whether it's from your job, too much exercise or purely emotional – your adrenal glands release a stress hormone called cortisol. When you're chronically stressed and cortisol stays elevated, it begins to interfere with the hormonal signaling in your body. Cortisol can pull triglycerides from storage and carry them to fat cells located deep within your abdomen -- also called visceral fat. Increased levels of cortisol may also cause an increase in your appetite and your cravings for high-calorie junk food. As a result, if you're chronically stressed, you may eat more than you would if you were relaxed. If you suspect stress may be to blame for your growing stomach, start incorporating some stress reduction activities into your day. Yoga, meditation and deep breathing are three well-known ways to combat stress. You can also try keeping a journal, drawing or reading a book. Waking up tired and cranky isn't the only consequence of not getting enough sleep. Sleep deprivation affects your health in major ways. When you don't get enough sleep, ghrelin and leptin -- the hunger hormones -- become imbalanced. The amount of circulating ghrelin, the hormone that tells you you're hungry, increases, and the amount of leptin, the hormone that signals fullness, decreases. As a result, you may think you're hungry when you're not. Sleep deprivation also causes you to crave junk food, which can lead to overeating. If you notice your stomach starting to grow, take a look at your sleep patterns. The Centers for Disease Control and Prevention recommends that all adults get 7 to 8 hours of sleep per night. As you begin to approach middle-age, your proportion of body fat to body weight tends to increase. The effect occurs more often in women than in men, but in both genders, that extra weight tends to show up around the midsection. While you can't slow down the aging process, you can follow a healthy diet and exercise regimen, reduce stress and get enough sleep -- all of which can help you whittle away stomach fat. Centers for Disease Control and Prevention: How Much Sleep Do I Need? Do Abdominal Exercises Make Stomach Stick Out More at First?